You might have many friends in your contact list, but no matter how many you have, they are always never enough, being in a profession. So, when you go to the parties organized by the companies you get a chance to meet many new people, talk to them and build networks. This networking not only helps you but also the company as you are an asset of the company after all. You work from Monday to Saturday continuously and feel exhausted. Also, you might have the craving for a holiday or a party. So, if you go through such situation, it is advisable to never let go of the opportunity of getting relaxed. You need not be afraid of meeting the same people over again because it will let you know them on personal levels that will ultimately increase the professional bond between you and the other employees. You might not talk to the Co-workers on a regular basis, except to say hello, hi in the office, so it is a great chance to talk to your colleagues. Also, many employees in the company are only restricted to talking through emails and chats. So, the company party gives you a chance of socializing outside the walls of the office. All people are heterogeneous in nature in one or the other manner. So, when you step out of the confined shell, you get to experience the entirely different characteristics and features of people. This helps in knowing and understanding the psychology of the people at large. You come to know how people react to different things at times and it gives you a lesson also. So, there is lots more to learn about in enjoyable parties too. What if you never come out of the cubicle but you have been constantly a great performer? Nothing but you will be a lesser-known personality, rather you will only be known by the company people within and no one outside. So, why keep talent within you when you have got one to share with people outside too. It’s nothing like flaunting the talent and characteristics, but all about allowing the talent to get highlighted as it boosts one’s confidence level. If you are an employee with higher authority and position in the company then you are expected to nod head for everything even if it is a crime. This is because the bosses are always right. So, if you are invited to a company party, then the extent of your commitment is measured in terms of your answer to the invitation. You are anticipated with a positive reply. Even if you will not attend a meeting, there will be nothing like a hullabaloo but surely it would create a negative impact on the company unless you have a good reason to explain. If you are thinking of missing a company holiday party and stay at home, being a fresher, then I tell you, you are entirely wrong. Although you might have some awkward feeling of joining the same people, that too at a party; but it’s fine. Sometimes you have to work oppositely to your own will because it is also helpful. Well, being a fresher, you should not miss a party as you get a fair chance to involve with your colleagues and know them on a personal level. Maybe you find them different and kind towards you. You never know, its fair chance to grab and build your tuning with them. Maybe you are under scrutiny by the senior staff. So, if you are, then do not give a miss to the company’s holiday party because the boss himself is giving you an opportunity to build a reputation and being on a good side. It is a chance to schmooze your seniors, supervisors and even boss for putting an amazing impression. Look at the benefits and you will never miss a party. If you are a shy and introvert person then you should not skip the party. It aids in socializing and also shedding away the shyness. You get to interact with number of people at a time and that too on the topic other than office work. Also, what you know about yourself and not others are aware of it, will be known, which is indeed a good thing. It’s kind of a platform to showcase your hidden talent which otherwise in the office is not at all possible. This is a good thing to solve trifles with the ones you had or you still have. This is because living and working in an office with the trifles will not do any good for you rather it will just create a bad impression amongst others. So, if you have any kind of trifle with someone in the office, then better to solve it by reaching out to that person and talking peacefully over the matter. Usually, the social gatherings and the parties are the best way to solve the problems, so never miss any of the company parties. Meeting new people provide you with a number of ideas. Ideas can come from anyway, even from the way people talk, walk, behave and eat at the parties. Ideas are something which can erupt from anyway; it’s on you whether you are willing to adopt it or no. So, for this also, you are advised to attend a company holiday party and do not miss it at any cost. Do not take me wrong, you might have manners, but what is needed to behave at a party in front of others is entirely different. The way you behave and act in the office with colleagues is poles apart from what is required in a party. Which words, one should use and which words one should be careful of are to be taken care of when you are in a party. So, for this reason, too, do not miss a party. There is nothing that you need to pay, neither you will be on any type of loss. All what you will have is a profit of just learning many things which you might not come across otherwise. Also, it’s not a matter of getting in return, only then attend a party, but it’s something you get to know your weaknesses and the shortcomings when you talk to people around you. If you will not attend a party, it is obvious you will be napping, thinking of getting a day extra to relax and beat the bed whole day. This is not apt for you, as the time once gone is never back. So, it is better to learn new things and meeting people at social gatherings than sitting idle and killing precious time at home. You might be thinking of leaving the job for whatever reason, but are unable to approach people who could hire you and give you a chance to prove your might. For that, you will need to have easy access to a number of people so as to get the golden chance to work somewhere. For this, attending the parties are easy to access to searching for better job opportunities. Building contacts is one thing, but having contacts and maintaining them is another big thing. This is because it is easy to make contacts, but very difficult to maintain them. For maintaining, you are required to wish the known on every occasion, following them for no reason but to maintain the relationship, etc. So, if you are invited to a company holiday party, remember not to say no. Say yes and move to the party for vested interest. New trend not in the attire people adore but the new trends in the way the business parties are handled. In case you are asked to organize an event for your office, you should be aware of it. You can know about it only if you attend the parties, business meetings, social gatherings etc. even if you are noticing the attire of people, there is nothing bad, after all, it also forms a part of existing in the society. The parties give you a chance to know employees emotionally which is good for maintaining the contacts for longer span of time. This is because if you will have a professional contact, it will be demarcated to the level of work only, but if you will have an emotional contact, it will move with you even if you leave the company. Also, you never know when the need arises for someone’s help, so for that reason also it is better to attend parties than sitting in isolation at home. The company parties are the best ways by which you can promote your skills. It’s not about shouting at the party about the skills you possess, but talking in a manner that reflects your qualities to others; so that they think of you a talent-packed person. So, one can say, it is a great platform to promote your skills which indeed is the need of an hour. This is a simple fact that it is easier to degrade an image and a Herculean task to make it. So, you should know very well that saying no can easily affect your image. If you once reject an offer to attend a party, maybe for the next time you are not offered. This is because, when an employee refuses such small invitations, the company does not think of probable reasons one can genuinely have, but the obvious reason of avoiding can come into their mind. So, it is better to say yes than no when a company invites to a holiday party. The employees who are shy in nature and prevent to move out to people should surely attend the event. This is because it gives them motivation. If you are not able to present yourself in front of others, how do you expect to put yourself forward when the assignments or projects of presentation comes ahead. You won’t be able to do that. So, in all ways, it is better to attend the parties of companies. 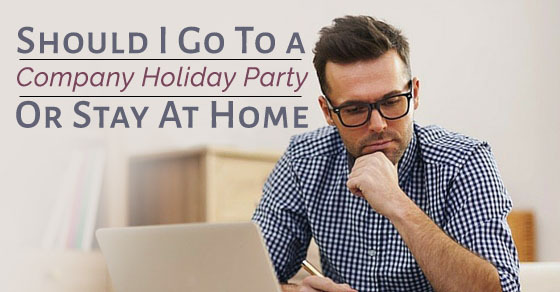 So, above are some of the reasons one must not stay at home, but attend the holiday party organized by the company. However, showcasing your enthusiastic behaviour is great, but to a limit, it should be portrayed. For example, drinking in the party is fine, but to the limit only. Extending the limit will only degrade your image. So, make sure to make your presence felt in the party, but by placing the best possible impression on the people or the attendees at the party.